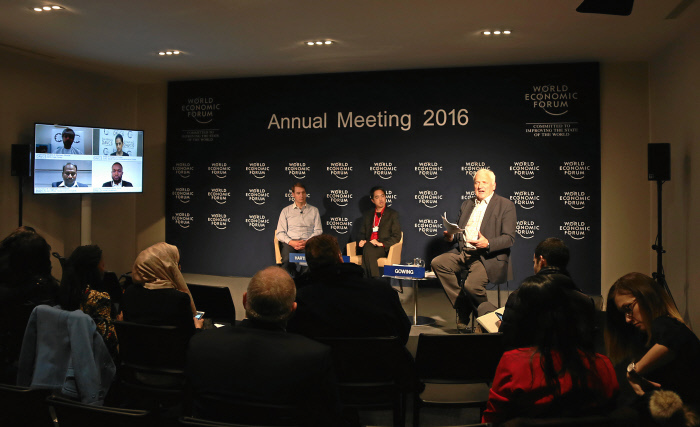 Startup investors at the ongoing World Economic Forum 2016 in Davos say yes, but proper mindset is key. POSSIBLE? From left: Mass Accelerator founder John Harthrone, 500 Startups venture partner Edward Thai, and BBC news presenter Nik Gowing discuss ways to create 75 million entrepreneurs. Photo by Remy Steinegger / World Economic Forum. The United Nations reported 75 million unemployed youth as of 2011, but startup investors said turning these unemployed youth into entrepreneurs is possible, as long as they have the proper mindset. This opened the conversation for the World Economic Forum in Davos, Switzerland on Wednesday, January 20. BBC news presenter Nik Gowing moderated the “Shaping Davos—Creating 75 Million Entrepreneurs: Is this Possible?” conversation with Edward Thai, venture partner from 500 Startups, and John Harthorne, founder of business accelerator Mass Challenge. The investors talked about how to inspire the youth to create businesses, and how to build entrepreneur-friendly ecosystems. “You may be born with or without the entrepreneurial spirit, but you still need to have the willingness to foster it. You have to be willing to take risks and fail,” said Thai on taking the leap in business. The Vietnamese startup venture partner also noted the importance of family support, especially in East Asian countries where “perfection” is expected from children. “In school, students grow up thinking failure is a bad thing and perfection should be achieved, but as entrepreneurs, you must be willing to take a lot of risks. I went home one day with a report graded with 97, and my mother asked me why it wasn’t 100,” Thai added. Harthorne echoed the sentiment. He cited the education system in the United States, which he finds “didactic,” and runs counter to the entrepreneurial mindset of solving problems. “I believe the education system has to shift to the idea of having more problem-solving, just to give kids the space to think critically, because as entrepreneurs, you'll spend a lot of time doing things alone. You have to be comfortable with ambiguity and tolerance for failures,” Harthorne said. ACTIVE PARTICIPATION. Some representatives from the Global Shapers community joined the conversation via Skype. Photo by Remy Steinegger / World Economic Forum. 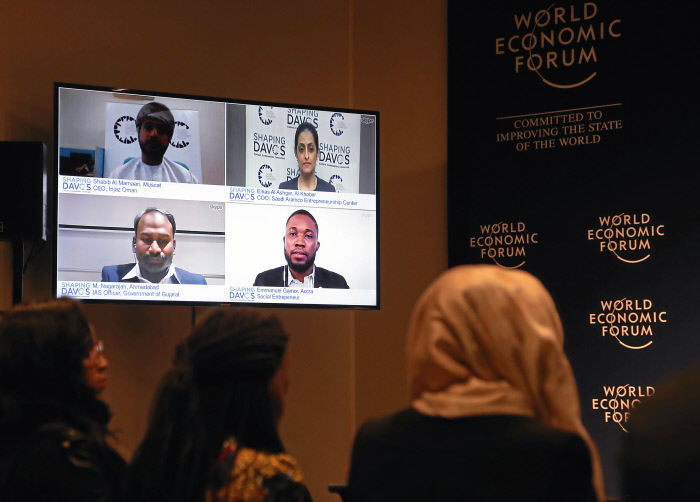 Other representatives from the Global Shapers community from Accra, Muscat, Al-Khobar, and Ahmedabad also joined the discussion, airing the mentality and resource problem of some areas. In Muscat, Shabib Al Mamaari, CEO of youth entrepreneurship non-profit Injaz Oman, shared how most fresh graduates prefer to do government work for stability, but hoped the tides change soon as the population gets younger. “65% of the population are youth, and they would need jobs in the marketplace. We have the resources available, we just need to have the mindset,” Mamaari stressed. This kind of mentality is also reflected in Saudi Arabia according to Einas Al Ashgar, COO of Saudi Aramco Entrepreneurship Center, with most people doing corporate work as it has been the common practice for so long. But with the shrinking prices of oil, Ashgar is positive it would be an exciting time for startups in Saudi Arabia. “Taking a corporate job is almost prerequisite of getting married. But with the shrinking prices of oil, it’s a great time for the youth to pursue entrepreneurship and diversify the economy, which is highly reliant on oil,” Al Ashgar added. A perfect ecosystem is non-existent anywhere in the world, even in the United States, which has six out of the top 10 places to build startups, according to metrics software company Compass, namely: Silicon Valley, Boston, New York, Los Angeles, Seattle, and Chicago, all with strict regulations and costly fees. The United States currently sits at 7th place in the Ease of Doing Business Index of the World Bank, but is only at 49th place under the “starting a business” category. “There needs to be dialogue with officials to understand what their worries are. Overtime, each of those elements can be pulled apart, and the government can see the opportunity. But yes, that takes time,” Thai said. Still, Harthorne believes ecosystems can be fostered anywhere in the world, as working around roadblocks is part of an entrepreneur’s DNA. “It’s doable to train people to do startups, what’s important is you inspire them first. Once people understand how to do so, they can never go back to working for somebody else. They will be passionate for opportunities and in improving the world,” Hathorne added. This year's World Economic Forum annual meeting started January 20 and will end on January 23, with about 2,500 participating leaders from business, government, international organizations, civil society, academia, media and the arts.